Continuing my interview with the Armenian artists exhibiting at the NPAK exhibition Toys of the Idle Time, the topics become more about individual art practices and the experience of encountering multiple worlds, every day. Artists often find themselves in a foggy grey area- neither here, nor there…almost as observers, even though their actions can be either a catalyst or a reactionary force. In this interview, Aleksey Manukyan reveals the faces of his reality and Varuzhan Sahakyan discusses sustainability in installation art. During my residency in Yerevan 2009, my paths crossed with Garik Yengibaryan as well as Aleksey Manukyan. Exhibiting alongside them at NPAK was Varuzhan Sahakyan, who was introduced to me by the curator Seda Shekoyan. Varuzhan Sahakyan (VAR) was born in Armenia to a family of two artists. He grew up in his father’s studio until he was seven; playing with clay, drawing and messing around. 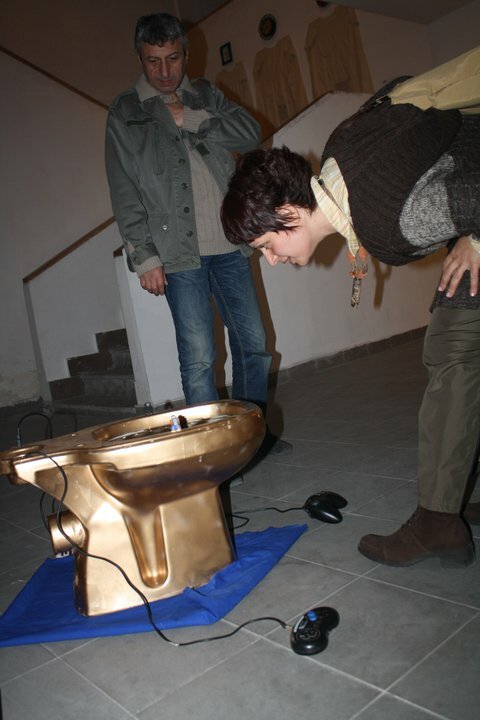 Recently, Varuzhan has gotten his art education and training in Berlin in the field of contemporary art and installations. His artistic related traveling has led him to the shores of Japan, Sweden and Italy. 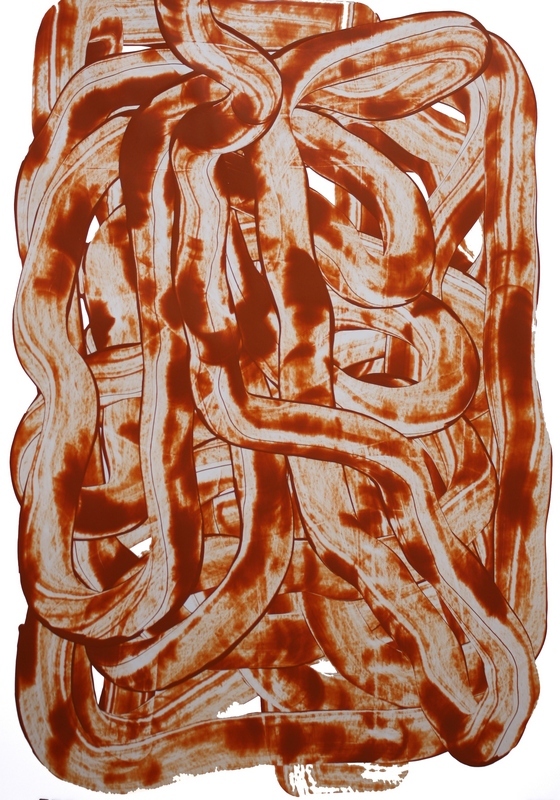 Sarah Kunkler: I notice that in NPAK’s current show, you use a variety of mediums- installation, sculpture, and painting. Are the pieces connected to each other? I would say that sustainable development issues are embedded within all of these installations -therefore sustainability is the connecting line of all my installations at NPAK. Here is a little explanation of the installation with the tree…. It’s called “Systems and Shadows”……. “Systems and shadows” is an installation where a dead tree is modified with lines, color and shapes in a way that it becomes alive again- only in a different – metaphoric way. It becomes a system-close to a violin, but rather different-because here- lines, shapes and shadows are inhibited by characters, which tell a story about the communication between man and nature. 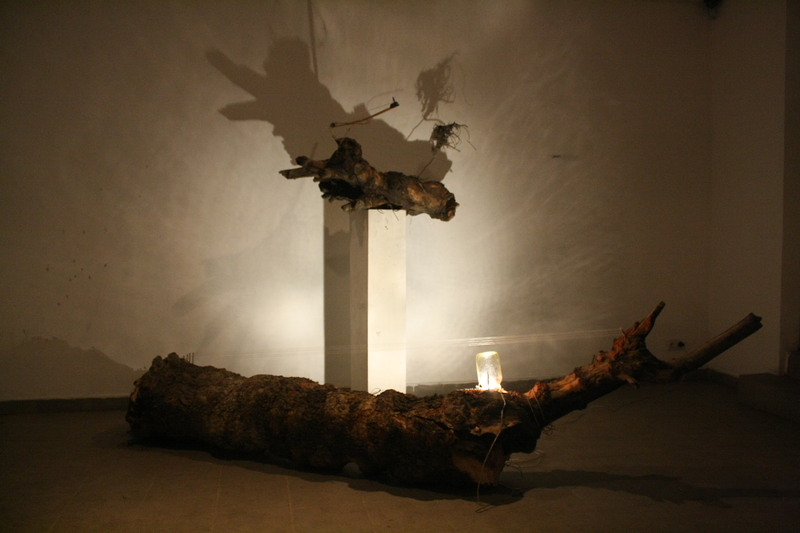 Then the wild pig looking log got on the stand and the shadows started creating a landscape on the wall. I then drew the inhabiting characters with a pencil on the shadows and I started noticing how an organic system started originated out of a lying log on the ground. The shadows of the log in this installation become another space, which is inhibited by drawn characters, which are in some state of dynamics-action—-trying to get somewhere to do something. This inner dynamic within the shadow world creates the dialog between the material and the shadow space-thus originating the organic system where certain questions of existence and rebirth are pursued. To me this raises questions about the process of recycling the processes of resources management and the human drive for more. In shadows you can see how little figures are crawling up the shadows of the lines. Sarah Kunkler: You’ve said that sustainable development issues are at the heart of your work. Do you have any future plans to work with this idea, or, what are your next projects? Varuzhan Sahakyan: Regarding sustainable development, I would like to say that I am really interested in the topic and would like to explore better the interrelatedness of procedures and subjects within systems. That is actually what the world is- one system where various procedures are interdependent. Sustainable development is the science that explores these relations and how this or that action in the political or economic sphere affects the social and the environment and the opposite. Of course, I would like to do all these things. I simply need to make for myself clearer what forms my future wanderings will take…. I don’t know that yet. I certainly wish to integrate more technology and IT in my work so that I can create environments and systems and experiment with them. For this reason I wish I could learn more about creating interactive environments by means of computer programs and objects…..in other words-programming objects to create a system and observe input/output relationships. Not directly linked to sustainable development but still an installation in that genre is an installation that produces music out of movement in a given space. If someone walks in the room -then the choreographic characteristics of the movements of the object is translated into tunes and notes. Of course this is a very complex project and I would need to work with people who are more experienced in using sensors and data analysis. Nevertheless, the idea is there and I would love to work toward its realization either within some artist residence program or by other venues. 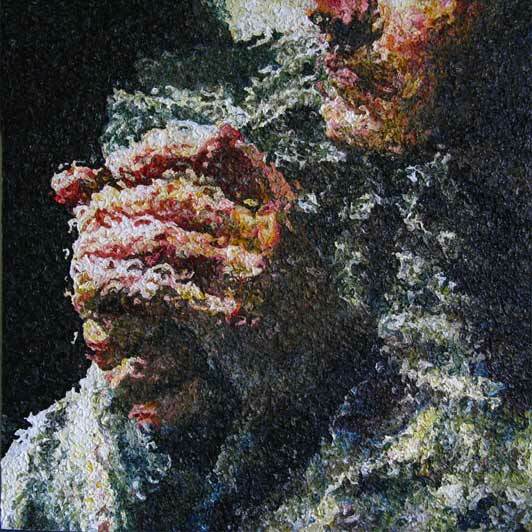 Aleksey was born in 1974 and studied painting at the Art Academy in Gyumri, Armenia, where he lives. Manukyan often participates in exhibitions of different styles and techniques of painting, photos and installations. His perception of art is his preferred mode of relating to the external world. Sarah Kunkler: I remember when I met you, and visited your studio in Gyumri, November 2009, you said something that impressed me, and that influenced what I did in my artwork after. You spoke how simplicity was important to your work, and your concept. Could you tell me more about this idea, in relation to your work? Aleksey Manukyan: Yes, the simplicity in my work is important. It is a contrast of our confused reality; in my country and in the world. I remember our conversation in the 5th Floor’s studio, in Gyumri. It was about a way of working and simplicity. To draw a simple line is easy, but before you have to find your way and overcome it step by step. The studio, where I am working, the reality outside of my studio and my job as an art therapist with disabled children is a different world. The time spent in my studio, city and therapy center is different. In my studio it is my imagination and me, the city is society and historical heritage and disability, which have another time perception. Every day I am changing three different time levels. This is my difficult daily life, and my motivation to create, and to simply be. 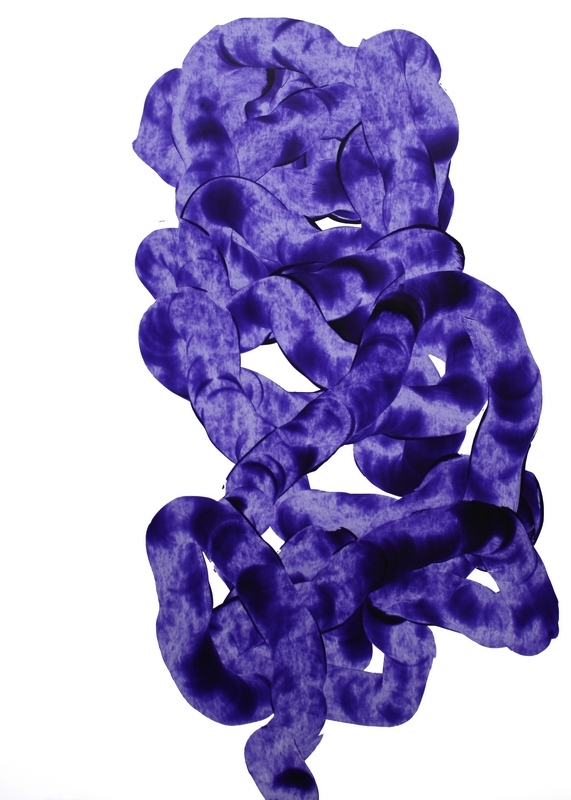 Sarah Kunkler: So, what are you exhibiting in Dresden? How do you think these 3 different perspectives and ‘time zones’ influence your art? Aleksey Manukyan: The exhibition in Dresden is a screening of Parajanov‘s films and a group photo exhibition of Armenian, Georgian, German, Russian, and Austrian artists. It is part of the project ‘Transkaukazia“. The title of my photo project is “Forgotten Memorials”, art that overtly addresses social subjects. 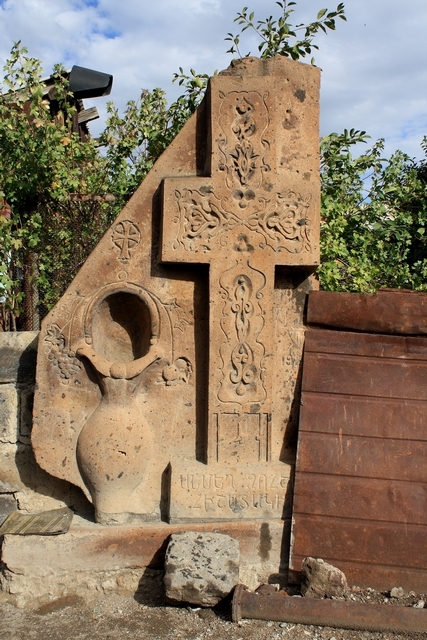 It is about memorials, which were constructed in Gyumri after the 1988 earthquake, but most of them are now forgotten. We started the interview from another point of view of art, art that is concerned with aesthetic and formal matters, but gradually we change our talk to a social topic, and time is social phenomenon, which has a directly influenced my art. Art is that point where crossing different social phenomena with time meet. Sarah Kunkler: Could you describe for me these memorials after the 1988 earthquake? Where were these memorials? Who made them? How do they connect with the current situation in Armenia? Aleksey Manukyan : My father was killed in the 1988 earthquake. I was fourteen. Not only did I experience grief at the loss of my father, but my life was completely altered. I and other boys my age wandered aimlessly around the devastated city. We had no schools, nowhere to go, and no money to spend. At that time, during Perestroika, artists had more freedom to express themselves and many began erecting khachkar memorial fountains. While the khachkar itself is an ancient design, the fountain aspect was a new design, with the water symbolizing a new beginning. Thus, the memorials are a bridge between the past and the present, and a vehicle enabling people to express grief, remember loss, but move on into rebuilding for the future. Eventually, when I was eighteen, I studied with a sculptor and made a khachkar in the memory of my father. The experience of sculpting this Khachkar was a catharsis and a coming of age experience for me. Today, however, that khachkar and many others are becoming neglected and ruined. The fountains often are no longer working, and garbage is strewn around them. I hope, with my project, to restore some respect for the memorials, and, through them, to instill hope for the future in the people of my city. Before dedicating his work to creating artwork Garik Yengibaryan studied international law receiving a with a degree from the Gladzor University in 1997. At the time he became closer to a group of artists who were his friends. He was inspired and began to create his own art. 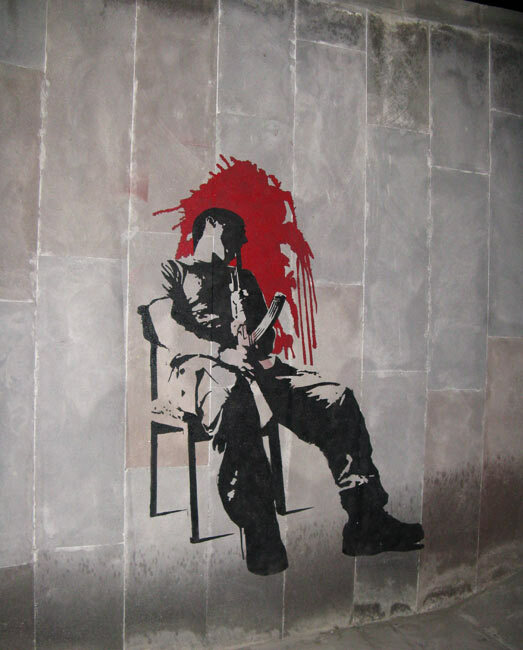 It wasn’t until the March 1st protests of 2008, that Garik felt moved to combine his two passions in politics and art, creating works cemented in protest housed on the streets of Armenia. Garik and friend, artist Edgar Amroyan began to create graffiti around Yerevan that meant to inspire social change. Sarah Kunkler: So, I know a little bit about your recent collaboration with Edgar. Could you tell me, from your perspective, what this project is about? Garik Yengibaryan: The “Public space” project belongs to Edgar Amroyan and me. Subsequent to the police violence’s that took place on 1st of March, 2008 in Yerevan, we very strongly wanted to carry out a public project outside of the artistic places – outside in street. 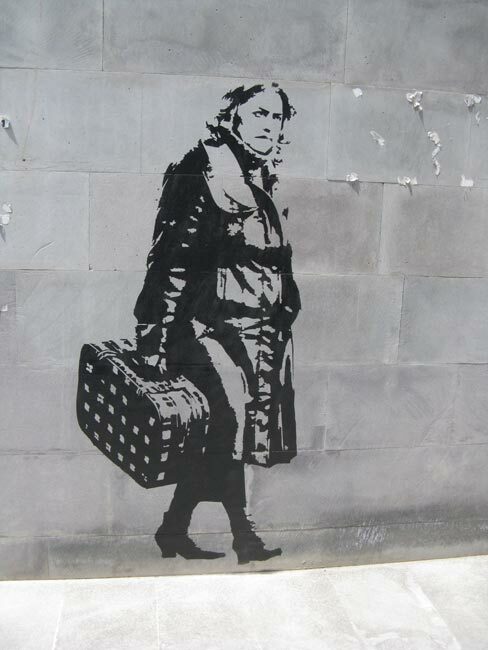 We were touched by works of British artist Banksy so much that we preferred to keep to his style. The idea of one of our works – a turnover policeman – was inspired by works of Italian artist Maurizio Cattelan. As we were working on the project, Vardan Jaloyan has stated that using underground transitions for our works, we specify and we fix not privatized and noncommercial public territories. We liked that idea and decided to name our project “Public space.” The project was carried out with support of “Art Laboratoria” NGO. Sarah Kunkler: When did the idea of this suicide soldier come to you and Edgar? Was there one specific event? I know that the riots on March 1 2008 were, and still are, extremely influential to artists. Garik Yengibaryan: Nazaret Karoyan invited us to participate in an art festival with any stencil based work, at the same time in which some suicides happened within the Armenian army. I came up with the idea of a suicide-soldier, and Edgar liked this idea. Firstly Nazaret agreed, but after he denied. In the end, Edgar and I decided to do it ourselves in Yerevan. Sarah Kunkler: So, Garik, what is next for this project? Garik Yengibaryan: I don’t know. Now both Edgar and I are working on our separate projects, but this does not mean that we do not continue this project. Now we have invitation from Germany, and me, Edgar and Ara must prepare a new project about “YEREVAN-GERMANY marshutka”, this is a German’s idea.